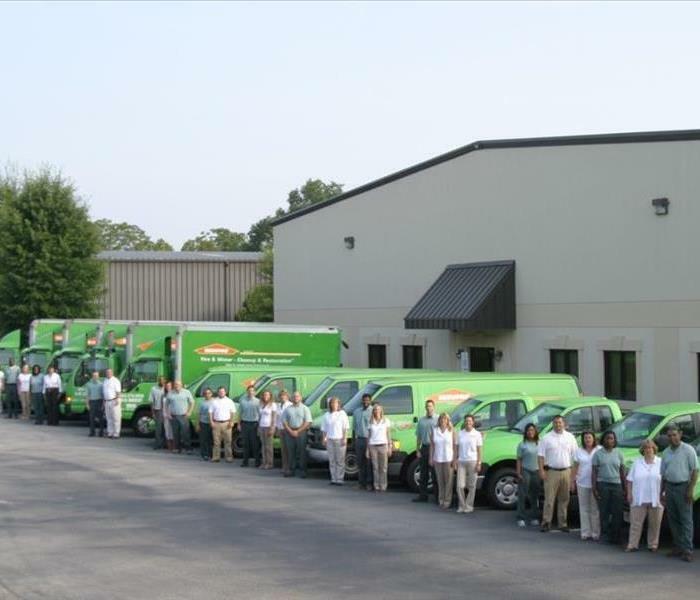 At SERVPRO of Henry and Spalding Counties, we have highly trained professionals available to help you 24 hours a day, seven days a week for any kind of water or fire emergency cleanup. 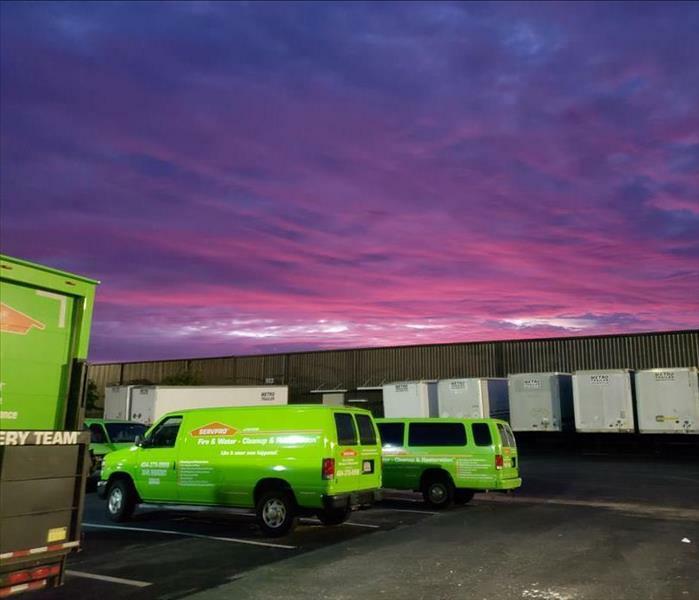 One of our crew members took this wonderful picture as they were loading the trucks very early in the morning before going to a big commercial job. After seeing such loss, you value your hard work, and know that you are making a difference. 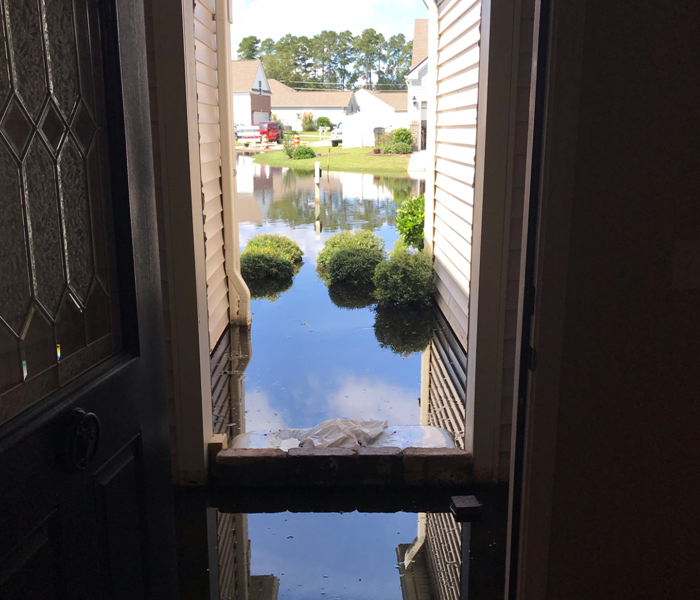 During Hurricane Florence, SERVPRO of Henry and Spalding Counties was able to go to South Carolina and help with the mitigation process after devastating floods hit that wonderful state. Our crews worked 12+ hour days in houses that did not have electricity or running water. 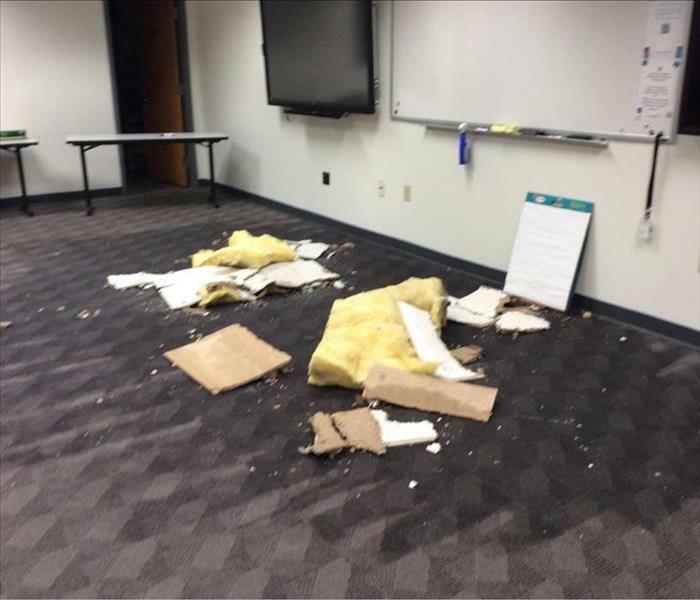 They had to rip flooring, drywall, water logged contents, etc., and they did not complain once. They knew that they were making a difference with the homeowners. 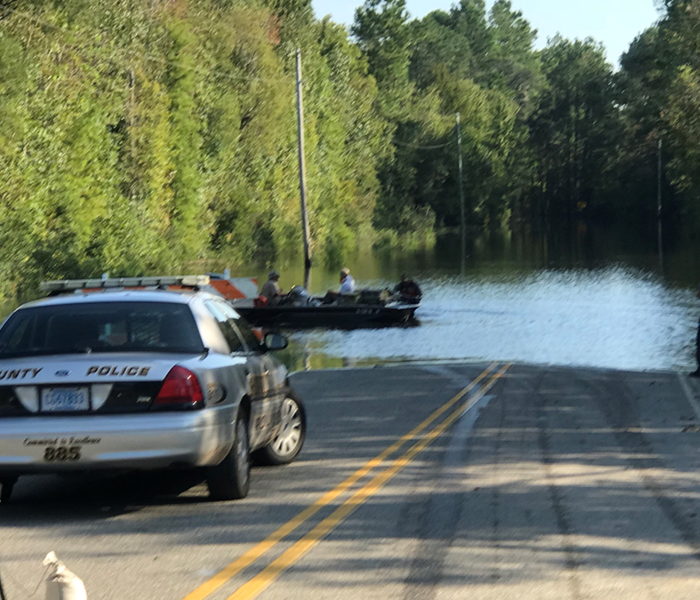 After one of our production managers returned from assisting during Hurricane Florence in the Carolinas, he said he would never forget driving through the flooded neighborhoods and seeing the devastation all around him. He said that it was an honor to assist and get homeowners on their feet after that horrible catastrophe. Is that mold, or did you forget to clean the ceiling? Do you think you are seeing mold in your bathroom? Well, bathrooms contain the perfect environment for mold, there is a lot of moisture, warmth and poor ventilation. If you don’t know how to handle the cleanup up process, call a professional. SERVPRO of Henry and Spalding Counties can help you take care of the problem. If you ever experience a water damage, and the water restoration process was not done properly, mold can start spreading under your floor boards and up the walls very quickly. 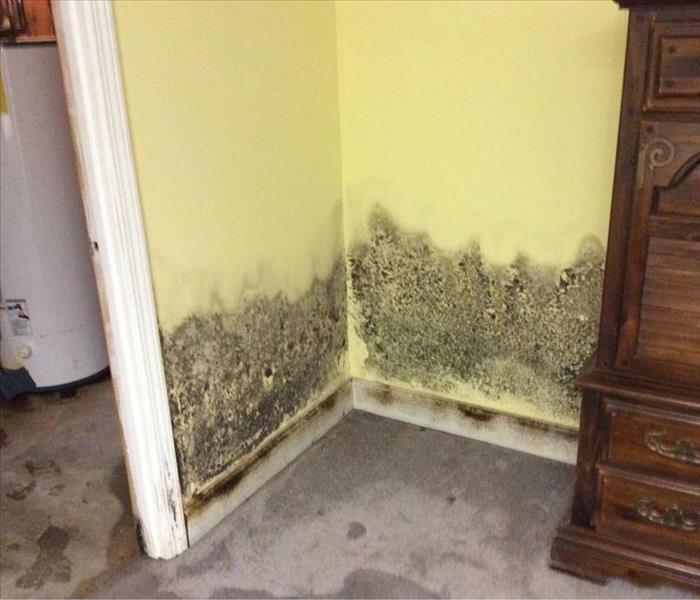 Be sure to check for signs of mold growth if you had a leaky appliance, a faulty hot water heater, or a water loss. If you don’t know how to proceed, call SERVPRO of Henry and Spalding Counties today. One of our customers returned home to find that the hot water heater in the basement was leaking and had sprayed water all over the floors, up the walls and the surrounding furniture. When he discovered the damage, there was extensive mold growth on the walls and some furniture. He did the right thing and call SERVPRO of Henry and Spalding Counties right away. Let us help you get rid of it! 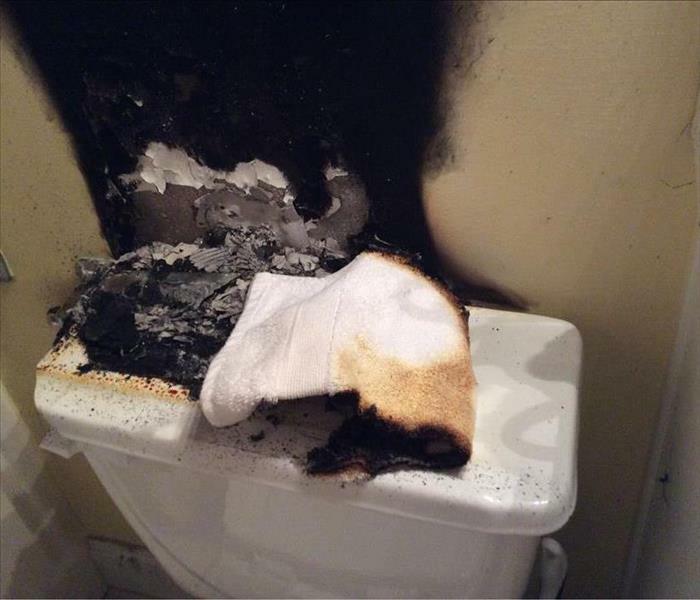 Leaks from hot water heaters, sinks, showers, or in this case toilets can happen to anyone. If a water leak happens in your house be prepared and call SERVPRO of Henry and Spalding Counties to help with the damages. Strong winds have the ability to destroy anything that gets in its way, and the tree outside this home was no match for the storm that hit it. If a storm causes damage like this to your home let SERVPRO help you out! A storm can hit your home at any time during the year. When a thunderstorm blew through this neighborhood the winds got so strong that they ripped part of the roof off, sending water all throughout the home. If a storm hits your home, let SERVPRO of Henry and Spalding Counties help you out with the damages! While candles can be a nice addition to a home, they need to always be monitored! When this candle was left burning in the bathroom it caused a fire to break out. Luckily the flames were contained to the bathroom, but smoke and soot still spread throughout the home. After the hot water heater in this basement sprung a leak it distributed water all over the walls, floors, and contents that surrounded it. All of the water caused mold to grow on the walls and some of the contents being stored in the basement. If you ever run into mold in your home, let SERVPRO of Henry and Spalding Counties help you get rid of it! 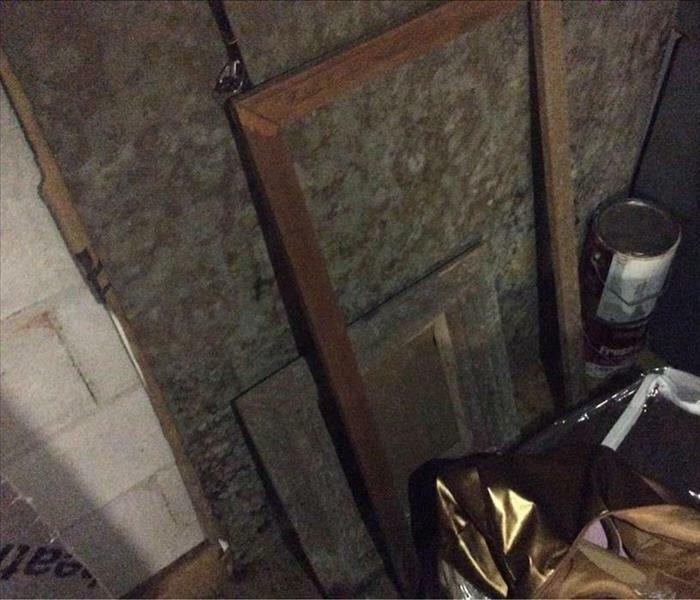 When a hot water heater busted in these homeowners basement it spread water all over the floors and items being stored around the source of water. 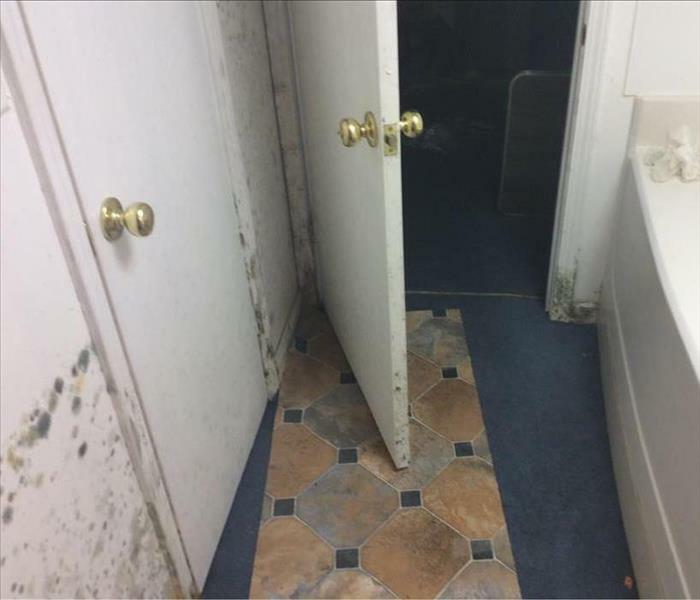 All of the water caused mold to grow on some of the walls including the bathroom pictured. If you ever run into mold in your home, let SERVPRO of Henry & Spalding Counties help you get rid of it! 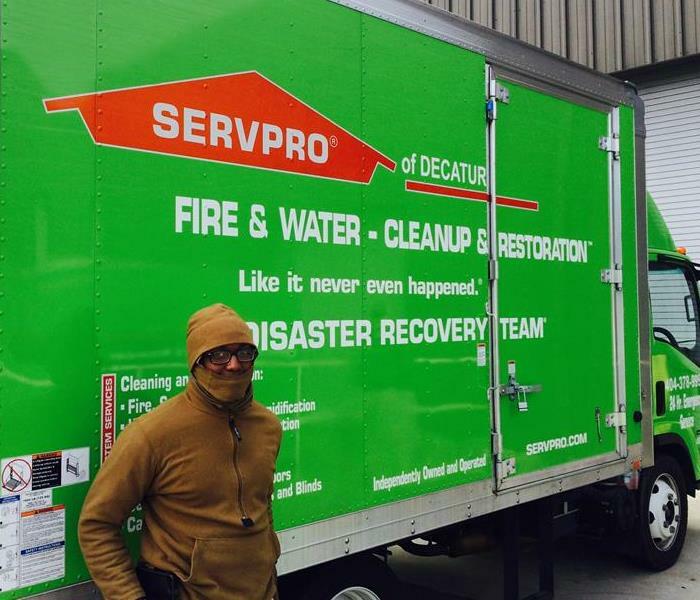 As a trusted leader in the restoration industry, SERVPRO of Henry/Spalding/Clayton and Decatur has highly trained technicians that are dedicated to responding faster to any size disaster. We provide 24-hour emergency service and have the training and expertise to handle your restoration and cleaning needs. When a fire broke out from an unknown source it caused damage to the outside of this home. Our SERVPRO fire crew came in and quickly dealt with the damage to this home to make the owner feel "Like it never even happened." When running or managing a retail business it is very important to keep the merchandise safe and in good conditions. 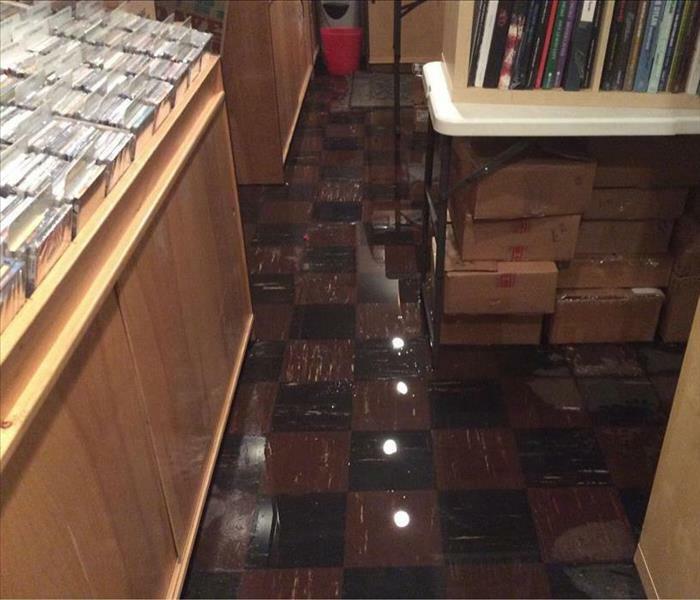 When water leaked into this local CD & Vinyl store the owners were nervous about all of their valuable merchandise getting destroyed. 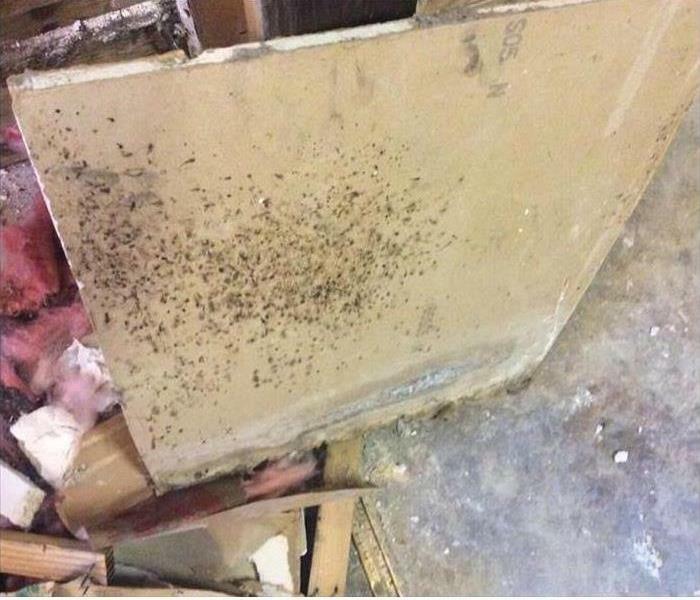 Luckily they moved quickly to minimize the damages and called SERVPRO to help them clean up the mess! After this stove caught on fire it brought a scare to these homeowners, but they acted quickly and put it out before it could spread throughout the entire kitchen. Even though the fire was put out in a hurry, smoke managed to spread all throughout the house. Our SERVPRO crew came in to help these homeowners clean up the small fire damage and help remove the smoke and soot from the home. A leaking washing machine caused water to get all over the floor in this homeowner's laundry room. 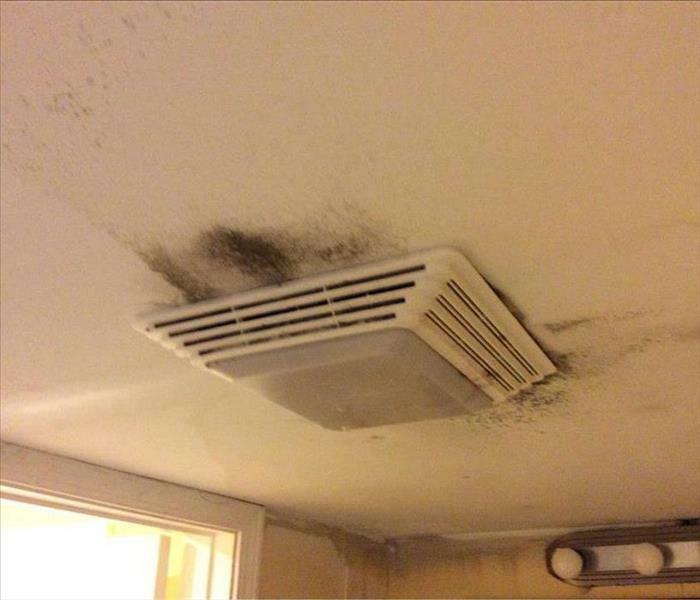 Since the resident was out when this leak occurred it caused a water stain to form on the ceiling. Once the water was discovered these homeowners called SERVPRO to help them deal with the damages. A storm that blew through did a number on this house because it caused a large tree to fall on and almost completely wipe out the backside of this home. 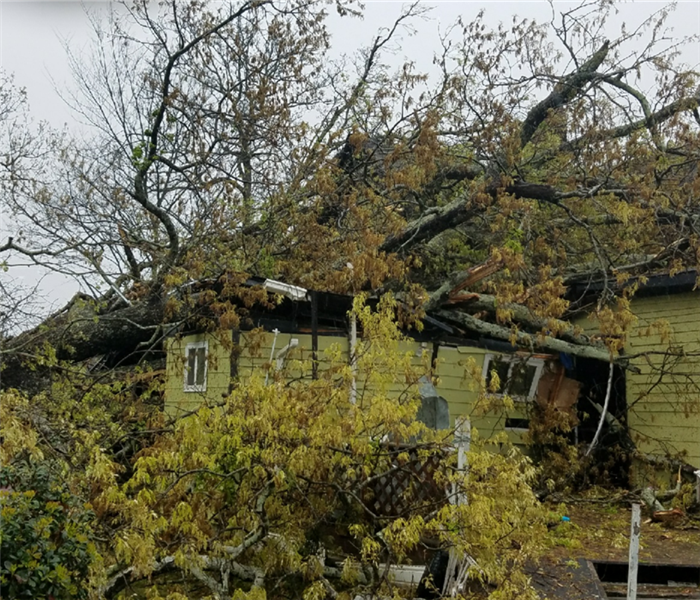 SERVPRO was able to help with the aftermath of this disaster by boarding up the open sections of the home once the tree was removed. After a candle was left burning without anyone watching it, it caught fire to this homeowners bedroom. Thankfully the fire was put out before it could spread throughout the house, but many things in the bedroom were destroyed such as this jewelry holder! SERVPRO of Henry & Spalding Counties was able to help these homeowners restore their bedroom and remove the smoke and soot from their home. 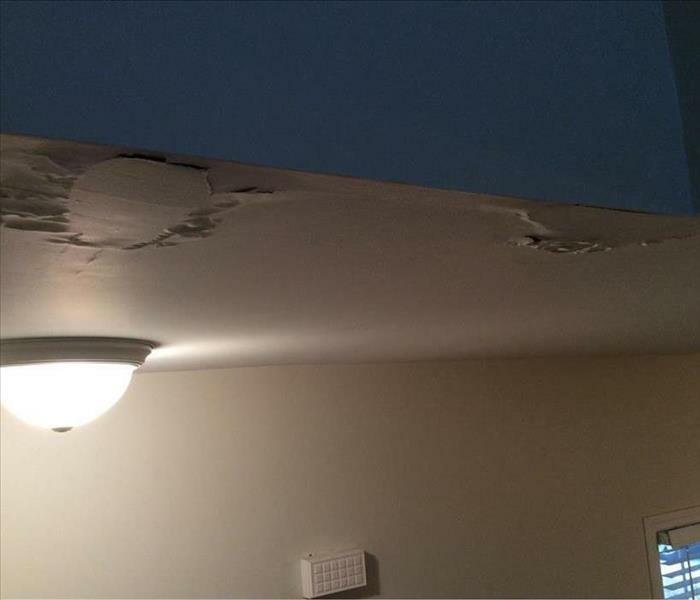 This home had water trapped in its ceiling from a toilet line leak. The homeowners called SERVPRO of Henry and Spalding Counties to come out and help with the cleanup. 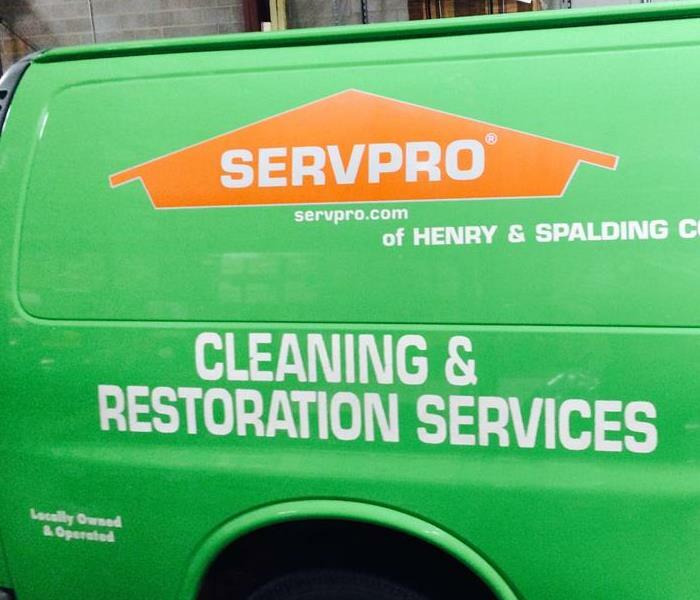 SERVPRO of Henry and Spalding Counties are here to help with all your water damage needs to your home or commercial property! 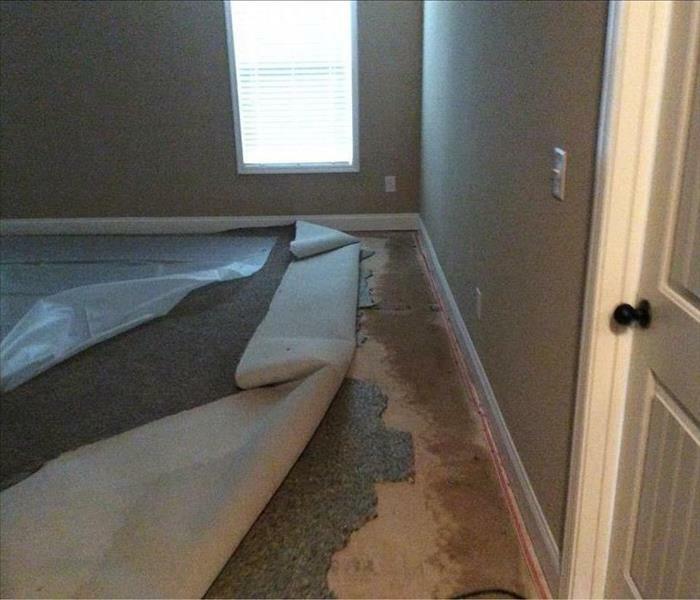 When this homeowner came home from a nice relaxing vacation he was startled to find that his basement was flooded from a leak in his hot water heater. Not only did he have water everywhere, but because he was gone when the leak began mold was growing all up the walls in his basement. SERVPRO came in and basically helped to remodel this basement and remove all of the water and mold. 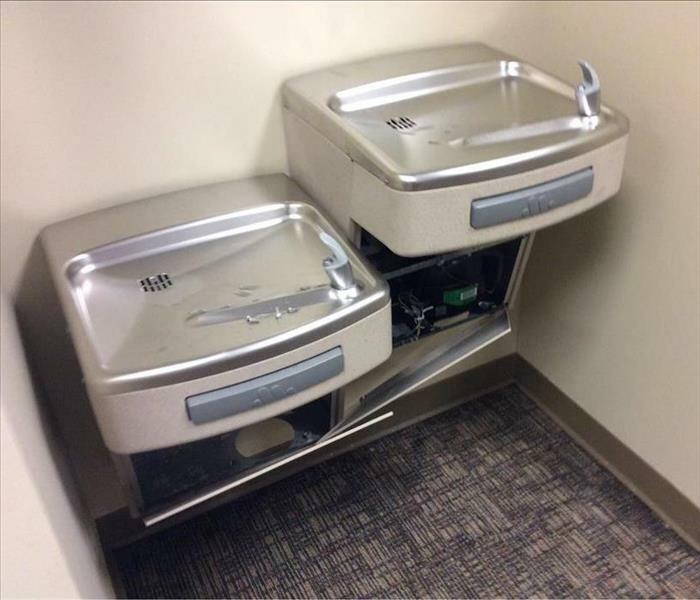 We all recognize these water fountains and see them in almost every building we go in, but if they malfunction in your office building make sure you know who to call! 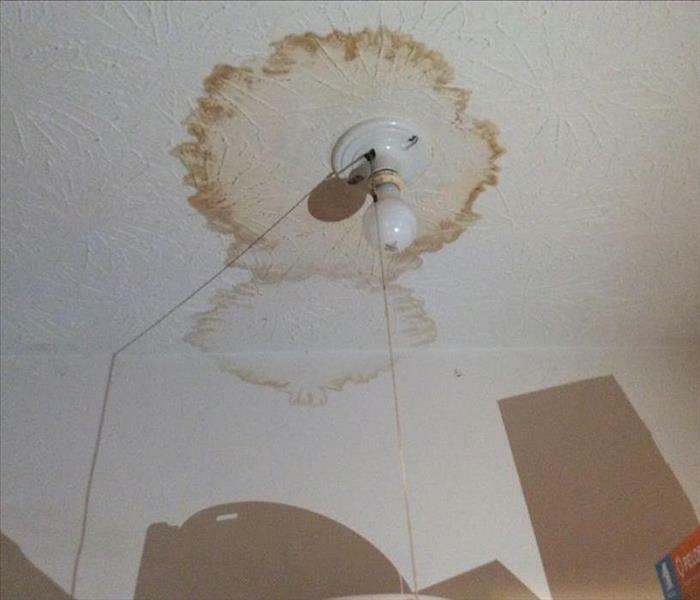 SERVPRO of Henry and Spalding Counties can be on site to help you clean up a leaking mess like this! Call us at 678-432-3003! 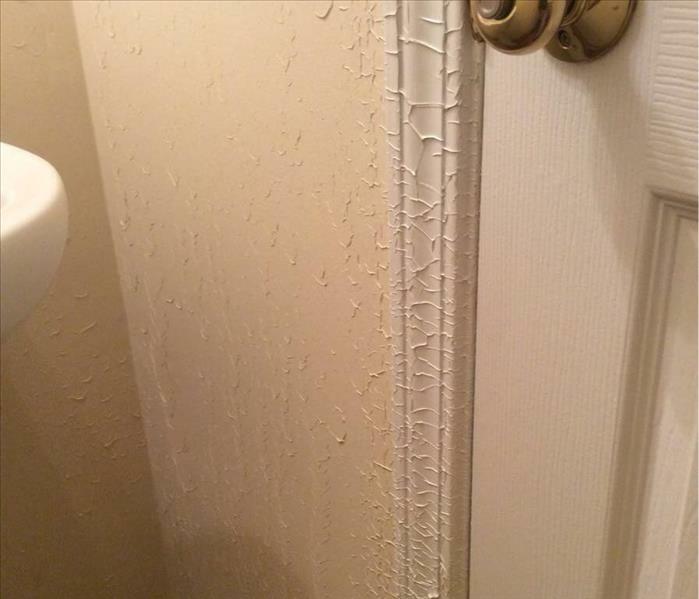 When a pipe in the hall bathroom sprung a leak it caused the walls to get wet and the paint around this door frame to blister. Our crew had to come in and remove the trim of this door as well as other structural aspects in the bathroom. 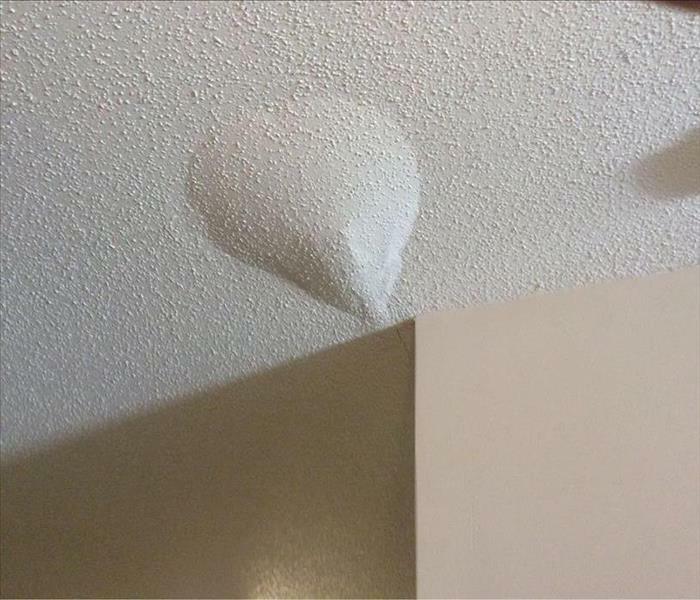 If you see any blistering like this in your home let SERVPRO of Henry and Spalding Counties know so that we can help you find the source of the problem! 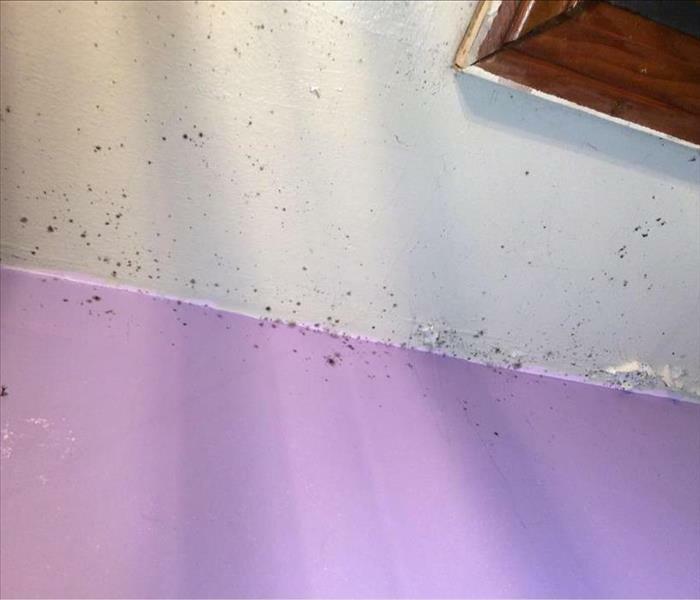 When rain hit Henry County for what felt like weeks without end, this homeowner began noticing mold growing on her bathroom ceiling. 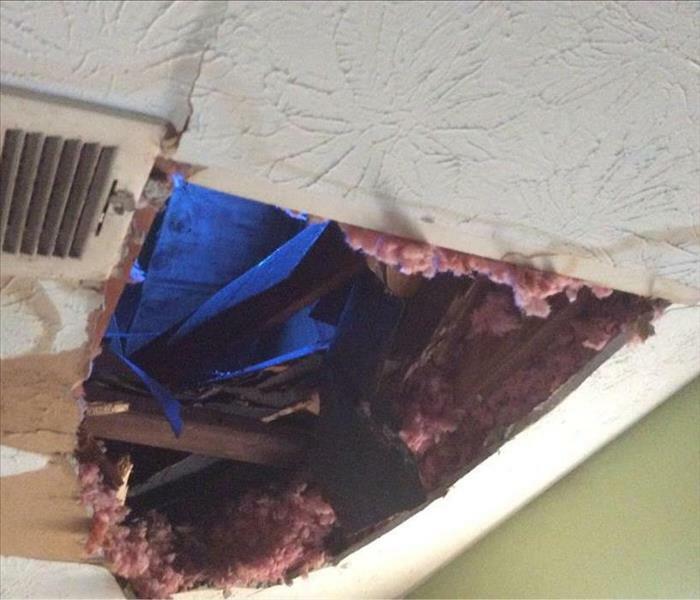 Our crew later discovered that it was caused from a hole in her roof where rain water was able to get in. SERVPRO helped this homeowner through this stormy time and got her bathroom into a condition where it was safe to use again! This was the aftermath of a fire that broke out in the master bedroom of this home. Our crew rushed over to this scene after hours in order to help these homeowners through this stressful and emotional situation. SERVPRO of Henry and Spalding Counties wasted no time and went ahead and boarded up two exterior windows in this home to prevent any further damage from the rain that was expected to come in the next couple days. After lighting hit a tree in this homeowners backyard it caused the tree to fall straight onto the house and badly damage the roof and several rooms inside the home. Once the tree was safely removed from the home our crew at SERVPRO of Henry and Spalding Counties came in and began treating the water damage to the inside of the home caused by the storm. When a hot water heater busted in these homeowners unfinished basement it spread water all over the floor and items being stored down there. 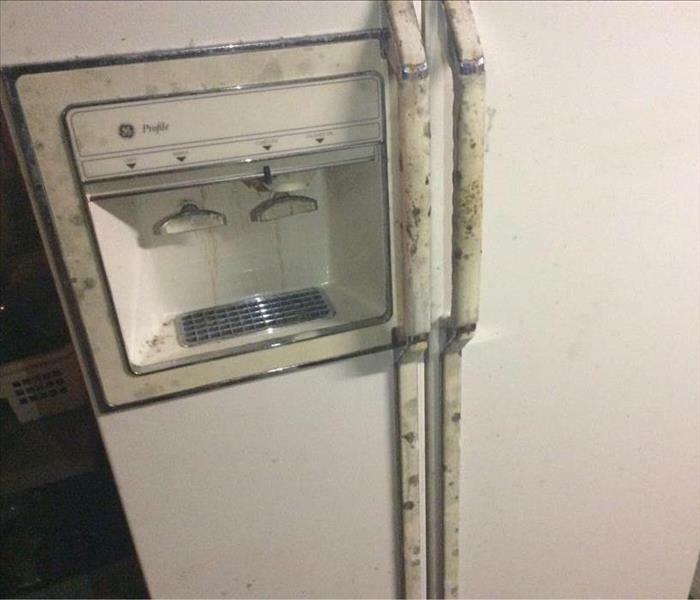 All of the water caused mold to grow on some of the contents including this refrigerator. If you ever run into mold in your home, let SERVPRO of Henry and Spalding Counties help you get rid of it! When a fire broke out in the kitchen of this home, not only was the kitchen nearly destroyed but smoke and soot damaged a majority of the rooms. Our SERVPRO crew worked very hard to remove the smoke and soot from all the surfaces of this home. Mold can be tricky to deal with and sometimes will try and hide inside your walls or floor boards. 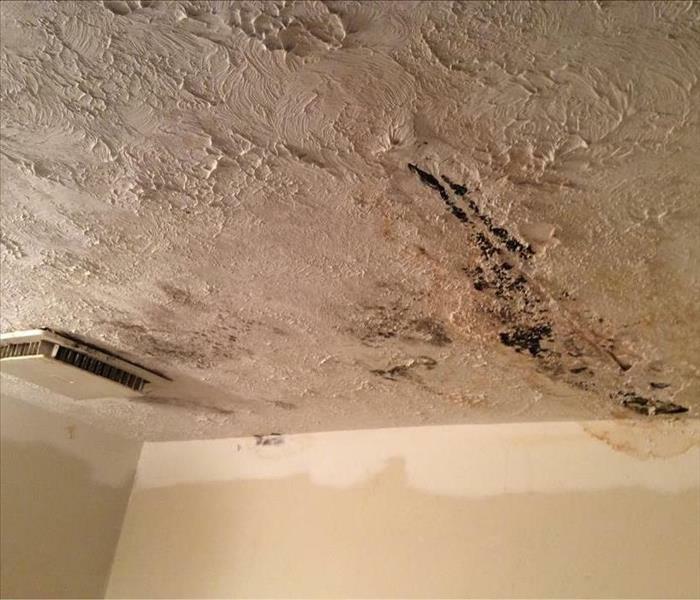 If you ever experience water damage or are aware of a leak make sure you check for signs of mold growth so that SERVPRO of Henry and Spalding Counties can help you get rid of it before it gets too bad! No business owner or employee wants to walk into their warehouse on a Monday morning and find puddles of water all over the floor! 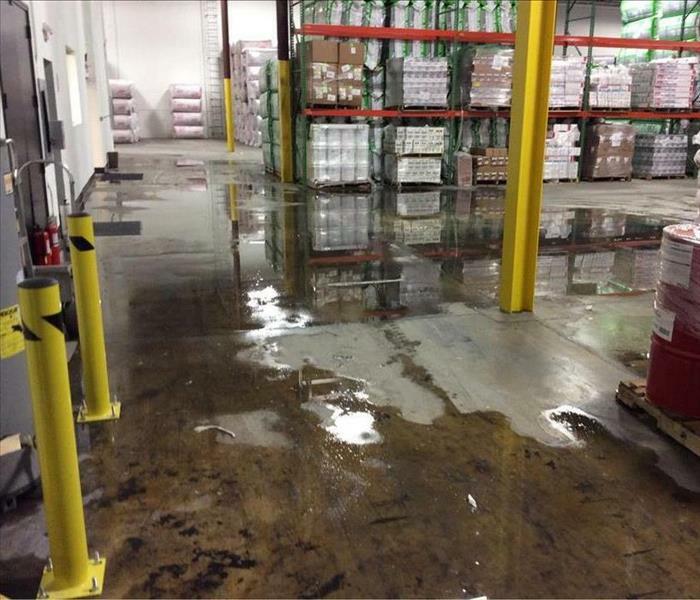 When a burst pipe causes a disaster like this in your warehouse, let SERVPRO help clean it up! A cooking mishap led to a grease fire in this home causing their microwave to almost be completely destroyed. 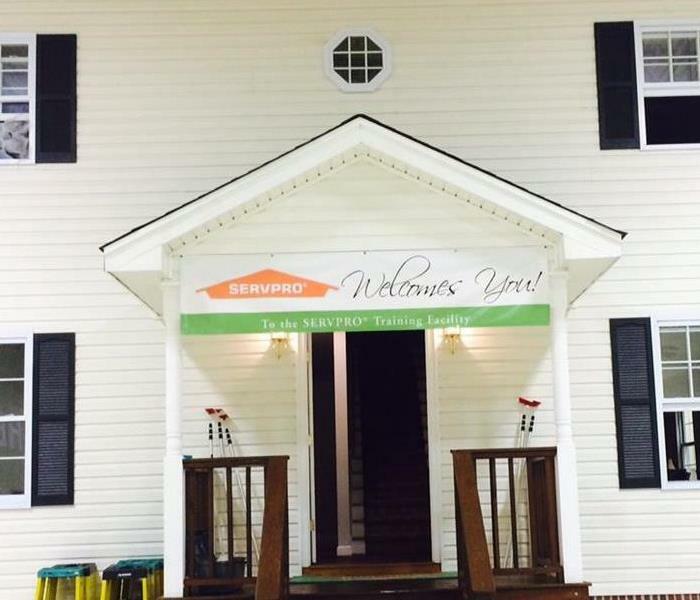 The fire created smoke and soot damage throughout the home, so SERVPRO of Henry and Spalding Counties swooped in to help clean and restore the kitchen! Mold seeks moisture, food, and warmth all three of which are common in bathrooms with poor ventilation. If you find mold growing anywhere in or around your bathroom contact SERVPRO of Henry & Spalding Counties and let us take care of it for you! Give us a call at 678-432-3003. A fire breaking out in your home is always a scary situation. Once the fire department gets the flames put out you might be left with only half the home you once had. SERVPRO of Henry & Spalding Counties can help deal with the damages of any sized fire. After a tree fell on this property from a big storm they thought everything was fixed since the tree was removed and the roof was no longer had a hole in it. But several weeks later the homeowners began to see mold growth leading up to their attic. They called SERVPRO of Henry and Spalding Counties where we discovered that there was damage from the tree that was never properly dealt with which caused the mold! Our professionals are ready when you need us! Our 25,000 square foot warehouse is "home" to our franchise team and fleet but also contains 18,000 square feet of storage to meet our valued customers' needs. 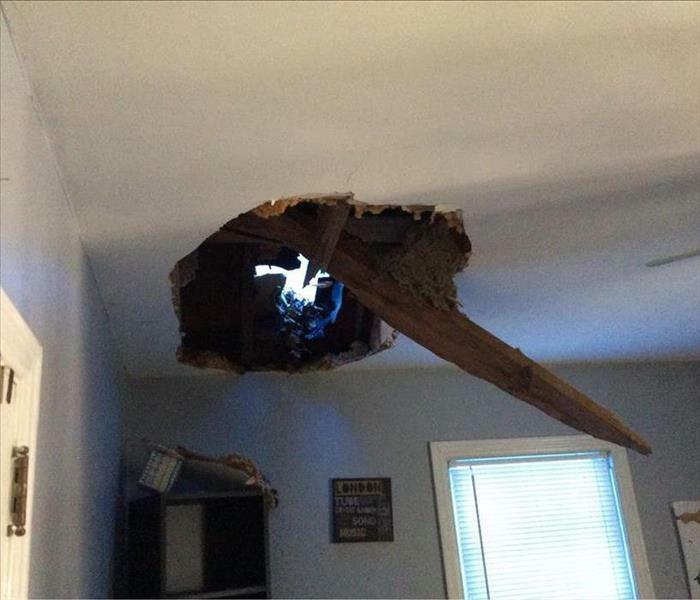 After being out of town for a week this homeowner ran into an unpleasant surprise when he discovered that the laundry sink supply line in his finished basement busted and caused damage to his entire basement, including his exercise room! 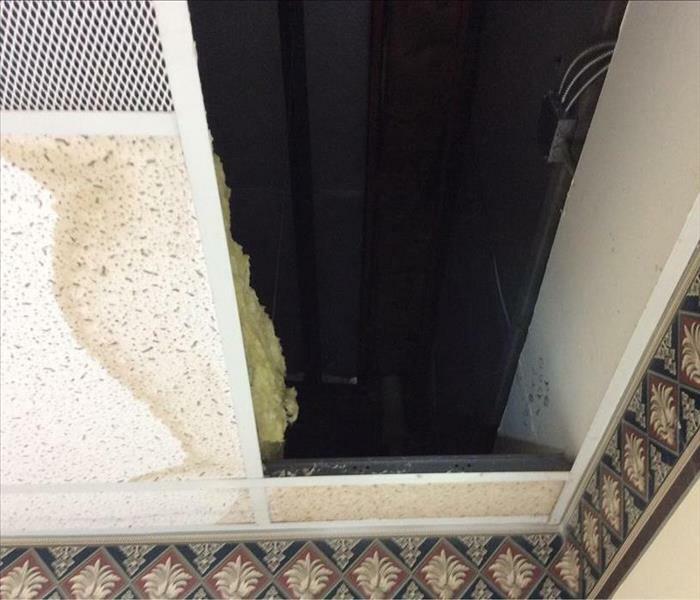 When this Commercial property experienced an influx of water from a large rain storm they had to deal with falling ceiling tiles and water all over their floors. SERVPRO of Henry and Spalding Counties came in to help this business in need in order for them to feel "Like it never even happened!" Production Technician, Richard Corbett prepares to battle the weather to serve our valued customers. Rain, sleet, snow or high winds can’t knock us down in getting to our customers in need. 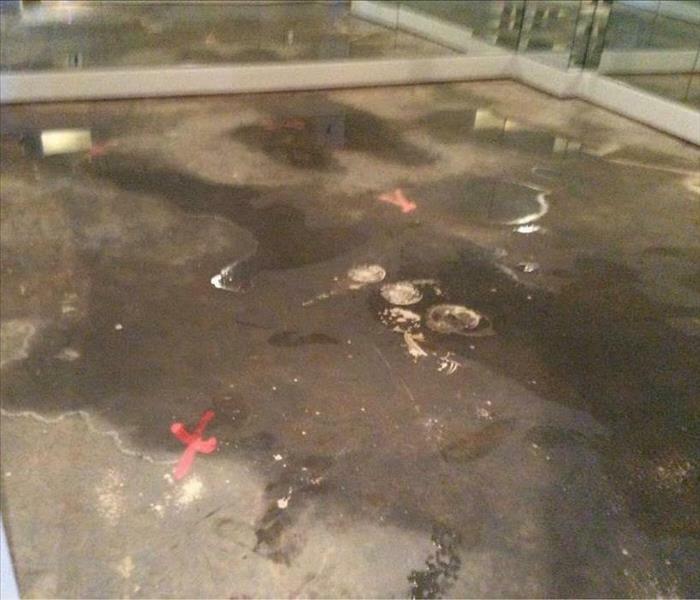 A pipe can burst at any time and cause water damage throughout your commercial business. If you ever are forced to deal with a mess like this, follow in this company's footsteps and call SERVPRO of Henry & Spalding Counties to help clean up and restore your business! Our professionals train in the corporate training house in Gallatin, TN. This was designed to provide hands-on training at our corporate training facility. 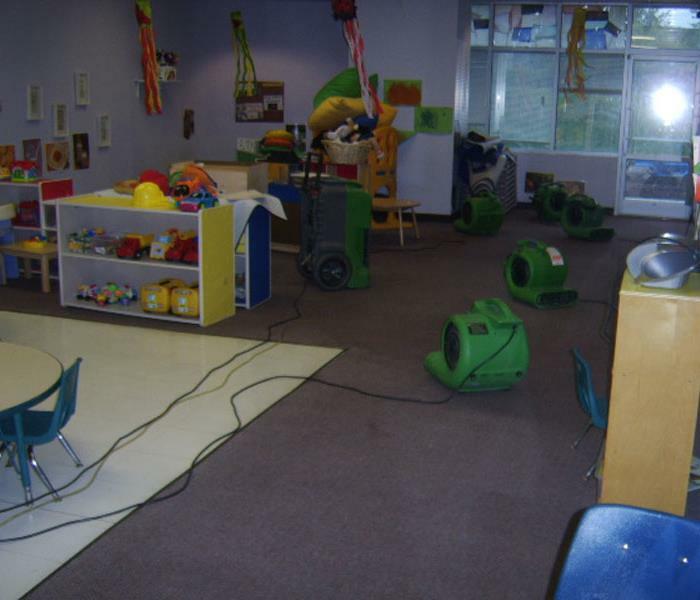 Our franchise assisted a Preschool Academy open their doors after a water damage occurred. We received great feedback after the job was complete. Our goal is to make your business look and feel "Like it never even happened."